The Amateur Service will officially get two new bands in the near future. The FCC has adopted rules that will allow Amateur Radio access to the 630 and 2,200-meter bands, with minor conditions. A Report and Order (R&O) was released on March 29. The effective date of the new rules is hard to predict at this point; more below. (This corrects and updates information that appeared in The ARRL Letter edition that circulated to members.) The R&O, which also addresses several non-Amateur Radio issues, allocates the 472-479 kHz band (630 meters) to the Amateur Service on a secondary basis and amends Part 97 to provide for Amateur Service use of that band as well as of the previously allocated 135.7-137.8 kHz band (2,200 meters). The R&O also amends Part 80 rules to authorize radio buoy operations in the 1900-2000 kHz band under a ship station license. "It's a big win for the Amateur community and the ARRL," ARRL CEO Tom Gallagher, NY2RF, said. "We are excited by the FCC's action to authorize Amateur Radio access for the first time on the MF and LF spectrum." The FCC said the Amateur Radio service rules it has adopted for 630 meters and 2,200 meters allow "for co-existence with Power Line Carrier (PLC) systems that use these bands." Utilities have opposed Amateur Radio use of the MF and LF spectrum, fearing interference to unlicensed Part 15 PLC systems used to manage the power grid. Amateurs operating on 472-479 kHz would be permitted a maximum equivalent isotropically radiated power (EIRP) of 5 W, except in parts of Alaska within 800 kilometers (approximately 496 miles) of Russia, where the maximum would be 1 W EIRP. Amateurs operating in the 135.7-137.8 kHz band could run up to 1 W EIRP. The FCC is requiring a 1-kilometer separation distance between radio amateurs using the two new bands and electric power transmission lines with PLC systems on those bands. Amateur Radio operators will have to notify UTC of station location prior to commencing operations. The FCC also placed a 60-meter (approximately 197 feet) above-ground-level (AGL) height limit on transmitting antennas used on 630 meters and 2,200 meters. The bands would be available to General class and higher licensees, and permissible modes would include CW, RTTY, data, phone, and image. Automatically controlled stations would be permitted to operate in the bands. More details soon, on the ARRL website. The fact that the new rules contain a new information-collection requirement -- notification of operation to the UTC -- makes it difficult to guess at an effective date. The FCC R&O says the Office of Management and Budget (under the Paperwork Reduction Act) must first approve the information-collection requirements (in §97.303[g]). Then, the revised Part 97 rules sections will become effective after the FCC publishes a notice in The Federal Register "announcing such approval and the relevant effective date." One of the enduring mysteries of the 20th century was the 1937 disappearance of famed aviator Amelia Earhart and her flight companion and navigator Fred Noonan, while she was attempting to circle the globe. It appeared that Earhart's plane went down in the South Pacific in the vicinity of Howland Island; her last-known radio transmission came from there. On February 18, a team from Nauticos -- with stratospheric explorer Alan Eustace and aviation pioneer Elgen Long, W7FT -- departed Honolulu for the vicinity of Howland Island, some 1,600 miles to the southwest, to complete the Eustace Earhart Discovery deep sea search for Earhart's lost Lockheed Electra. Nauticos provides ocean technology services to government, science, and industry. Tom Vinson, NY0V/mm, on the Mermaid Vigilance, with Education Officer Sally Smith. The team has been conducting a sonar survey of about 1,800 square miles of sea floor where it's believed the aircraft may rest, and Amateur Radio has provided a means to link the crew of the research vessel Mermaid Vigilance with youngsters following the expedition, as well as with the International Space Station (ISS) crew. Among those involved in the Earhart search is ARRL Midwest Division Director Rod Blocksome, K0DAS, of Iowa. Earhart was born and raised in Kansas and lived in Iowa and Minnesota. Bryan McCoy, KA0YSQ, of Iowa, also is on the Mermaid Vigilance, which is carrying out the deep-water sonar search for the lost aircraft. The team is using autonomous underwater technology provided by the Woods Hole Oceanographic Institution to image the ocean floor nearly 18,000 feet below. On March 17, the team launched the REMUS vehicle to search the depths of the Central Pacific. On March 20, another Midwesterner -- Tom Vinson, NY0V, of Minnesota -- joined other crew members in making contact with US Astronaut and ISS Commander Shane Kimbrough, KE5HOD, who was at the controls of NA1SS aboard the ISS. A couple of Russian-speaking crew members also had the opportunity to speak with one of the cosmonauts on board the ISS. Teacher Kathy Lamont, KM4TAY (right), with her fifth graders, as they speak with Vinson on board the Mermaid Vigilance. Earlier, on March 15, Vinson assumed Kimbrough's role to host a question-and-answer session of his own, with Virginia fifth graders in the classroom of teacher Kathy Lamont, KM4TAY, an alumna of ARRL's Teacher Institute. The contact was routed over 20 meters from the vessel to Hawaii, and then via EchoLink to Virginia. "My kids had a lot of fun," she recounted later. Vinson said that promoting science, technology, engineering, and mathematics (STEM) education "is what we're all about," with support from Rockwell Collins. According to The Daily DX, Vinson has been on 7.027 and 7.165 MHz around 0600 UTC "and whenever I am up on the sunrise across the US." Blocksome will join him in Majuro, where they will operate April 5-7 using the V73 prefix with their home call signs. A thorough and fully annotated discussion of Near Vertical Incidence Skywave (NVIS) is available in the research paper, "Radio Communication via Near Vertical Incidence Skywave Propagation: An Overview," by Ben A. Witvliet, PE5B/5R8DS, and Rosa Ma Alsina-Pagès. First investigated in the 1920s, NVIS propagation was rediscovered during World War II as "an essential means to establish communications in large war zones such as the D-Day invasion in Normandy," the paper notes, adding that the US Army subsequently sponsored a lot of NVIS field research, especially between 1966 and 1973. More recently, NVIS has become a popular means to enable close-in communication on Amateur Radio HF bands between 3 and 10 MHZ. NVIS can be used for radio communication in a large area (200-kilometer radius) without any intermediate manmade infrastructure, and it has been found to be especially suited for disaster relief communication, among other applications, according to the paper. "A comprehensive overview of NVIS research is given, covering propagation, antennas, diversity, modulation, and coding," the Abstract explains. "Both the bigger picture and the important details are given, as well as the relation between them." As the paper describes it, in NVIS propagation, electromagnetic waves are sent nearly vertically toward the ionosphere, and, with appropriate frequency selection, these waves are reflected back to Earth. "The great reflection height of 80 to 350 kilometers results in a large footprint and homogeneous field strength across that footprint," the paper says. "Due to the steep radiation angles large objects such as mountain slopes or high buildings cannot block the radio path." As for NVIS antennas, the paper stipulates that important parameters are antenna diagram, polarization, and bandwidth. "As only high elevation angles contribute to NVIS propagation, optimizing the antenna diagram for these elevation angles will increase the effectively transmitted power and improve the signal-to-interference ratio at reception." "Speech Equalization, Compression, and Processing" is the topic of the just-released episode of the "ARRL The Doctor is In" podcast. Listen...and learn! ARRL is accepting applications for summer 2017 Teachers Institute on Wireless Technology sessions until May 1. This summer's sessions will be held in Dayton, Ohio -- hosted by the Dayton Amateur Radio Association (DARA) -- and at ARRL Headquarters in Newington, Connecticut. (DARA also helps to sustain the program as a generous contributor.") Past participants who have completed the introductory (TI-1) course may consider signing up for the advanced (TI-2) session on Remote Sensing and Data Gathering. These expenses-paid, intensive professional development opportunities offer educators training and resources to explore wireless technology in the classroom using Amateur Radio. At a 2016 TI session in Colorado, computer teacher Bill Hunt (right) and algebra teacher Kevin Horack work on a class project. Introductory (TI-1) ARRL Teachers Institute sessions will take place July 17-21 in Dayton, Ohio, and July 24-28 at ARRL Headquarters in Connecticut. 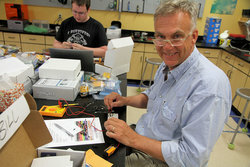 One advanced (TI-2) ARRL Teachers Institute class will be held July 10-13 at ARRL Headquarters. An article in the March issue of QST includes the schedule and description of offerings. The article "Amateur Radio in the STEM Classroom" in the April 2016 issue of Tech Directions discusses how four Teachers Institute graduates employ Amateur Radio in their classrooms. This video offers an inside look at the Teachers Institute. More information is available on the ARRL website. Register to receive news about ARRL Education & Technology Program activities and notifications about the summer 2017 Teachers Institutes. Contributions from individuals and from corporate and institutional supporters make the annual ARRL Teachers Institutes possible. AMSAT has announced that the launches of its Fox-1Cliff and Fox-1D CubeSats have been rebooked from a single launch to separate launches. Both satellites initially were set to go into space on the Spaceflight FORMOSAT-5/Sherpa mission aboard a SpaceX Falcon 9 (Sherpa is launched as a rideshare program for small, low-budget satellites). Fox-1Cliff will launch on Spaceflight's SSO-A dedicated rideshare mission aboard a SpaceX Falcon 9 scheduled to launch from California's Vandenberg Air Force Base in late 2017 or early 2018. Fox-1D will ride into orbit on an Indian Polar Satellite Launch Vehicle set to launch late this year. "These moves will serve to expedite the launch of these two satellites, both of which carry an Amateur Radio U/V FM repeater and an experimental L/V FM repeater," AMSAT said. "The satellites also carry scientific experiments from university partners Penn State, Vanderbilt University ISDE, Virginia Tech, and University of Iowa." Spaceflight said the recently announced 2017 SpaceX manifest would have a "significant" impact on the FORMOSAT-5 mission. "We learned our launch would occur potentially much later than expected," Spaceflight President Curt Blake, said in a March 2 statement. Spaceflight rebooked its FORMOSAT-5 mission customers and found an alternative launch for each one, he said. On March 22, Ham Radio Outlet (HRO) closed its Sunnyvale, California, store -- one of its first -- which served the Amateur Radio community in the heart of Silicon Valley for more than a quarter of a century. One of five California HRO stores, the Sunnyvale store has been consolidated as a cost-saving measure with HRO's Oakland operation. "We needed to make some changes in our Northern California locations," HRO National Sales Manager Steve Gilmore, W4SHG, said in a statement. "Some of the costs associated with operating in the Sunnyvale location have absolutely skyrocketed, and the traffic and parking availability in our current Sunnyvale location has become seriously problematic." Employees in the Sunnyvale store were offered positions in the Oakland shop, about 1 hour away to the north along San Francisco Bay. Store manager Jon Kelley, K6WV, told The Mercury News that the region's rising minimum wage was also a factor. He said the Oakland shop had become a gathering place for regular customers from the area. One of those regulars, Gregg Lane, KF6FNA, president of the Santa Clara County Amateur Radio Association, told the newspaper, "This is depressing. It's like the end of an era. It's like your best friend moving away." For the closing, another regular, Steve Stearns, K6OIK, organized a flash mob -- his first -- and a final celebration by local hams of the store and its staff. "More than 60 hams descended on HRO Sunnyvale on its last day of business for cake and champagne," Stearns said. "It was a surprise party for the staff and customers alike." Shuttering the Sunnyvale store leaves HRO with 13 retail outlets around the US. Last year, HRO took over the former Amateur Electronic Supply (AES) store in Milwaukee after AES went out of business. 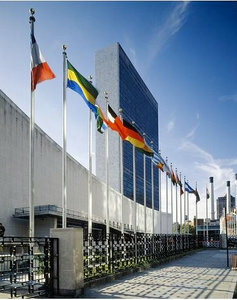 United Nations Headquarters Amateur Radio club station 4U1UN representatives are still in talks with the UN Department of Public Information with an eye toward permanently reactivating the station. Although within the geographical confines of New York City, 4U1UN qualifies as a separate DXCC entity. "Hopefully we'll have an opportunity to plead our case to the new administration as well. Keep your fingers crossed," said a post this week on the club's Facebook page. "4U1UN might be back on the air soon!" Earlier in March, the club alerted its Facebook page visitors to reports that a pirate identifying as 4U1UN was operating on RTTY. The station was on the air for real in 2015. To commemorate the UN's 70th anniversary that fall, 4U1UN operated as 4U70UN from a station set up at a ground-level garden area within the UN Headquarters complex. Unlike 4U1ITU at International Telecommunication Union Headquarters in Geneva, 4U1UN typically is not open for guest operation but is intended for recreational use by the UN Headquarters staff. Max de Henseler, HB9RS (SK), spearheaded the effort that resulted in the approval of a specially designated UN Headquarters Amateur Radio station, 4U1UN, in early 1978 (an Amateur Radio station under the call sign K2UN had operated previously). The 4U1UN United Nations Headquarters Station was dismantled in 2010 due to extensive renovation of the Secretariat Building. Security concerns and logistics have since stood in the way of its returning to the air. All antennas have been removed from the roof, and equipment has been packed away. Options reported to be under consideration have included controlling the station remotely, putting the station on the ground floor (and running some 400 to 500 feet of feed line to the top of the building), or moving the station to another sovereign UN building. Read more. -- Thanks to The Daily DX for some information. Telecommunication regulators in the Netherlands have scaled back considerably the liberal 60-meter privileges announced for radio amateurs in that country just days after the conclusion of World Radiocommunication Conference 2015 (WRC-15). 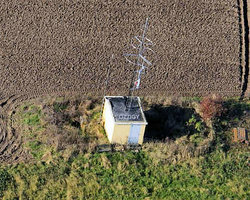 Since December 2015, amateurs in the Netherlands have had access to a 100-kHz wide amateur band at 5 MHz, with a maximum power of 100 W.
The Netherlands was able to do this because Article 4.4 of the ITU Radio Regulations permits countries to authorize frequency assignments that are contrary to the international Table of Allocations, only on a non-interference, non-protected basis. VERON, the IARU member society in the Netherlands, now reports that starting on April 1, Dutch radio amateurs will have to be content with the global secondary 15 kHz-wide allocation of 5351.5 kHz to 5366.5 kHz at up to 15 W effective isotropic radiated power that was agreed to at WRC-15. "This outcome of WRC 2015 is implemented by means of the present modification of the scheme," VERON said. The ARRL has petitioned the FCC to allocate a contiguous 5 MHz band in the US while retaining four of the five channels already in use. Radio amateurs in the Netherlands also will be permitted to conduct cross-band and duplex 50 MHz/70 MHz communication, starting on April 1. Not long after promoting Amateur Radio to Boy Scouts, the Belize Amateur Radio Club (BARC) introduced ham radio to University of Belize (UB) engineering students on March 22. The BARC presentation included a summary of the club's educational goals, a short video, and a lesson on Amateur Radio basics -- such as propagation and the RF spectrum, and a question-and-answer session. BARC presented a wide-ranging session on Amateur Radio to engineering students at the University of Belize. BARC President Emil Rodriguez, V31ER, encouraged the students to take advantage of the opportunities Amateur Radio offers to expand their skills in their fields of study -- mechanical and electrical engineering. The introduction represented a first step toward establishing a partnership between BARC and the UB Engineering Department, which envisions that students will learn such skills as antenna construction, electronic circuits, radio theory, and radio procedures necessary to obtain an Amateur Radio license in Belize. Following the BARC presentation, students and staff members expressed their intention to establish a UB Amateur Radio club and station. BARC said that, in addition to its educational benefits, a permanent ham station at UB would also allow students to become involved in supporting emergency communication during hurricane season. -- Thanks to International Amateur Radio Union Region 2 (IARU-R2) and BARC. 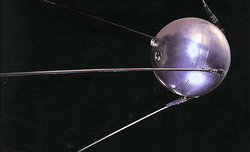 As part of an effort to tell the story of the International Geophysical Year (IGY) 60 years ago, a Cambridge, England, museum wants to hear from anyone who remembers the Soviet Union's launch of Sputnik 1 on October 4, 1957. Many radio amateurs and shortwave listeners (SWLs) of the era were among those thrilled to receive the satellite's 20 MHz beacon. The Scott Polar Research Institute Polar Museum at Cambridge University will mark the IGY anniversary later this year. The IGY was a global effort to better map and understand the planet, and it put heavy emphasis on Antarctica as well as studies of space and the atmosphere. The Polar Museum exhibition recount the story of Sputnik, the establishment of scientific bases in Antarctica, and the individuals involved in the IGY. "Although largely forgotten now, the International Geophysical Year involved many thousands of people from all of the world and from all walks of life," said Museum Curator Charlotte Connelly. "We'd like to capture some of those experiences in our exhibition and show the phenomenal reach of this important moment for global science." Contact Connelly via e-mail, if you were among those monitoring and/or spotting Earth's first artificial satellite. The exhibit, "The Year that Made Antarctica: People, Politics, and the International Geophysical Year," opens on April 26. 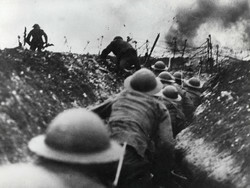 World War I commenced in Europe in August 1914, and the US, under President Woodrow Wilson, was determined to remain neutral. As the fighting and the enemy's resolve intensified, and Germany began sinking ships attempting to evade a naval blockade of England as well as non-military vessels -- including the Lusitania with a loss of nearly 1,200 lives -- it became inevitable that the US would enter the fray. Leaders of the newly formed American Radio Relay League encouraged the organization's 3,000 members to be prepared. The US officially declared war on Germany and Austria-Hungary on April 6, 1917, and the US government immediately ordered most private radio stations in the US either to shut down or be taken over by the government. For the duration of WWI, it was against the law for private citizens to even own an operational radio transmitter or receiver, so amateur transmitting and receiving stations had to be disassembled. Amateur Radio operating privileges were not restored until November 1919 (QST resumed publication a few months earlier). Once the US declared war, QST editorials urged qualified amateurs to volunteer their desperately needed skills to the military. Enlistees were particularly directed to the Navy, the nation's principal service user of wireless. The cover of the April 1917 edition of QST. A specific program was developed to induct volunteer amateurs into the Naval Reserve for the duration -- the Class 4 Naval Reserve. The requirements included citizenship, the ability to pass a physical examination, and skill in sending and receiving Morse code at 10 WPM. Many volunteering radio amateurs chose to join this reserve, ARRL's first Communications Manager Fred H. Schnell, 1MO, among them. He went to sea as a chief radioman. ARRL co-founder Clarence D. Tuska received a commission as a lieutenant in the US Army Signal Corps, and he established a radio training school at Ellington Airfield near Houston, Texas. QST suspended publication for the duration of the war. -- Thanks to Mike Marinaro, WN1M, and United States Early Radio History by Thomas H. White. 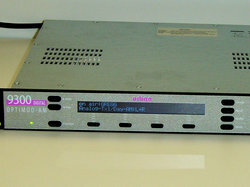 ARRL Receives Donation of Optimod 9300 from Orban Labs: Orban Labs Inc. has donated an Optimod model 9300 audio-processing unit to ARRL. Popular with AM broadcasters, the 9300 increases the loudness of a station's audio without overmodulation, through the use of sophisticated multiband limiting and clipping. The digital processing also minimizes distortion and other unwanted side effects. The 9300 includes a fully programmable equalizer that can be tailored to voice communications. Currently, the unit is being evaluated at the ARRL Lab and will be used in conjunction with upcoming QST "Product Review" articles. Its eventual planned use will be as part of the W1AW audio chain that feeds the station's bulletin transmitters, providing a greater presence on the air. ARRL thanks Mike Pappas, W9CN, Vice President of Business Development at Orban Labs Inc. for arranging this generous donation, made to support of the AM voice bulletin transmissions on W1AW that began earlier this year on 7.290 MHz. Centenarian World War II Veteran Victor M. Sokolov, U5FS, SK: Victor M. Sokolov, U5FS, of Izmail, Russia, died on March 25. At 103, he was among the oldest -- if not the oldest -- living radio amateurs. No formal records tracking the age of the world's radio amateurs are maintained, however. Sokolov lived through World War I, the Russian Revolution, and World War II, and told interesting stories of his wartime experiences, including the Kerch landing (Russian troops crossed the Kerch Strait in December 1941 in an effort to regain control of Crimea). While apparently inactive on the air for several years, Sokolov did join an unidentified caretaker in heartily singing a Russian song when he was 101. -- Thanks to The Daily DX for some information. Tad Cook, K7RA, Seattle, reports: Solar activity rose over the past week, with average daily sunspot numbers rising from 3.4 to 29.7 and solar flux from 71.2 to 77.9. The average daily planetary A index increased from 10 to 18.3, and the average mid-latitude A index went from 7.1 to 13.6. 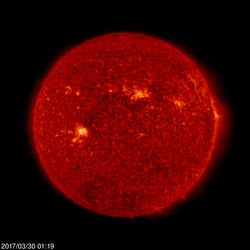 Predicted solar flux is 83 on March 30; 82 on March 31-April 3; 80 and 78 on April 4-5; 71 on April 6-14; 73 on April 15-17; 75 on April 18-22; 78 on April 23-26; 75 on April 27-29, and 73 on April 30-May 1. Predicted planetary A index is 24 and 20 on March 30-31; 16 on April 1-2; 14 on April 3; 12 on April 4-6; 5 on April 7-16; 24, 25, and 10 on April 17-19; 5 on April 20-22; 25, 40, 35, 20, 18, and 12 on April 23-28; 8, 16, 12, 15, and 12 on April 29-May 3, and 5 through mid-May. Tamitha Skov released a video a week ago, although it is a bit out of date by now, but her observations are always interesting. Sunspot numbers for March 23 through 29, 2017 were 12, 12, 11, 20, 49, 51, and 53, with a mean of 29.7. The 10.7-centimeter flux was 72, 72.3, 74, 77.2, 82.8, 83.7, and 83.3, with a mean of 77.9. Estimated planetary A indices were 11, 6, 4, 4, 54, 28, and 21, with a mean of 18.3. Estimated mid-latitude A indices were 9, 7, 3, 3, 34, 22, and 17, with a mean of 13.6.